Robot Chicken and DC Comics collide - who will survive with their super-dignities intact? NOBODY! In Robot Chicken's hands, Superman, Batman, Wonder Woman and even Mr. Banjo could end up dead or naked or both or neither! Created in the early 21st century, Robot Chicken offers a stop-motion comedy series that spoofs a variety of pop-culture subjects. For its latest iteration, we get Robot Chicken DC Comics Special, a take on that publisher’s superheroes. Don’t expect much of a plot here, as Chicken instead boasts a rapid-fire series of sketches/gags. These take the DC Comics characters and parody their personalities and earlier storylines. 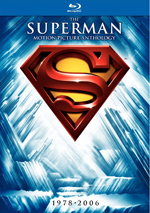 For example, view the comedic interaction of a bunch of cold-related villains, and we see Superman’s decision to overuse a power he showed in Superman II. We do get a general theme that comes with Aquaman’s feelings of neglect. He doesn’t think the other heroes like him and plots revenge. This adds an overall narrative but not a major one. The special comes packed with DC characters. In addition to usual suspects like Superman, Batman and Wonder Woman, we find plenty of lesser-lights. All get plenty of time to shine. I’d never seen an entire Robot Chicken program before I got this Blu-ray, though I’d witnessed some segments linked online. In terms of its comedy, Chicken can fall into the “throw everything at the wall and see what sticks” realm. That means a hit or miss approach with a decent signal to noise ratio but the occasional misfire. The rapid-fire nature of the show ensures that the bombs don’t stay with us for long, at least – and even the weakest gags have some merit, as I can’t think of a single truly lousy bit. That said, I also find it hard to remember anything that really tickled me. Chicken comes with a good collection of chuckles but nothing that ever rises above that level. While it has its laughs, it doesn’t provide anything rollicking, and I can’t think of any bits that stand out to me as genuinely inspired. Still, Chicken offers a fun program, especially for comic book fanboys who’ll get its inside jokes. I don’t know how it compares to other episodes, but DC Comics Special delivers reasonable entertainment. 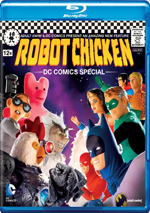 Robot Chicken DC Comics Special appears in an aspect ratio of approximately 1.78:1 on this Blu-Ray Disc. This was a good but not great presentation. Sharpness was usually fine. Overall definition seemed fine, though the image lacked the precision I expected; it showed positive delineation but wasn’t quite razor sharp. No moiré effects or jagged edges materialized, and I saw no edge haloes. Print flaws failed to appear. Colors worked pretty well, as the comic book material lent itself to a broad palette. The hues tended to be pretty peppy and lively. Blacks were dark and deep, while shadows showed nice smoothness. This was an appealing presentation but not one worth more than a “B”. 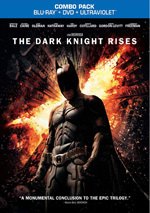 As for the show’s Dolby TrueHD 5.1 soundtrack, it lacked much oomph. The soundscape focused firmly on the front channels and didn’t do much with the back speakers. A thunder-based scene used the rears to a decent degree, but that was pretty much the only time they became prominent, as the rest of the track concentrated on the forward spectrum. Up there we got good stereo music and some decent action but not a whole lot of pizzazz. Audio quality was decent. Speech always appeared distinctive and concise, while music was reasonably clear and peppy. Effects seemed fairly accurate but lacked much punch; low-end response didn’t add much to the package. Though not a bad mix, this one seemed pretty average. To pad out the brief program, the Blu-ray comes with plenty of extras. 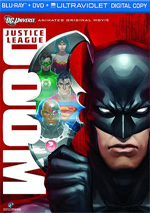 We find two separate audio commentaries, the first of which features writers Geoff Johns, Tom Root, Zeb Wells, Matt Beans, Kevin Shinick and Mike Fasolo. All six sit together for a running, screen-specific look at story/character topics, cast and performances, cut sequences and some general thoughts. While we get some decent notes, the track tends to be less than fascinating. The participants throw out info in a scattershot manner and the piece becomes a bit on the incoherent side. We do learn something about the making of the show, but not as much as I’d like. For the second commentary, we hear from actors Matthew Senreich, Abraham Benrubi, Alfred Molina, Seth Green and Tom Root. These five also sit together and deliver their running, screen-specific take on their love of comics, the design of the characters, some story and performance areas, and various musings about comics. This commentary’s more structured than its predecessor but not a whole lot more informative. It comes across as some guys talking about comics more than it does a discussion of the show, and there’s surprisingly little mention of acting in an actors’ commentary. Still, it’s fun enough and worth a listen. The Making of the RCDC Special goes for 10 minutes, 15 seconds and includes notes from Wells, Root, Beans, Molina, Green, head writer/executive producer Doug Goldstein, editor Jenny McKibben, head of character fabrication Tennessee Reid Norton, production designer Huy Vu, senior fabricators Nikki Rice Malki and Lauren Horoszkewski, junior fabricators Chelsea Bayouth and Melissa Bloom, animation supervisor Alex Kamer, director of photography Helder Sun, animators Dillon Markey and Michael Cranberry, and actors Neil Patrick Harris, Tara Strong, and Alex Borstein. We learn of some story/character issues, cast and performances, sets and puppets and animation, and additional challenges. “Making” is a bit quick and superficial, but it covers a lot of ground in its short running time, so it’s worth a look. During the one-minute, 26-second RCDC’s Aquaman Origin Story, we hear from Johns, Goldstein, Wells, Green, and Senreich. They debate about who thought up the show’s Aquaman story. It’s cheeky but not very interesting. Chicken Nuggets offers an interactive feature. When a chicken icon pops up during the program, hit ”enter” to see a “chicken nugget”. These essentially act as a video commentary in which we hear from Green, Johns and Senreich as they tell us about the sketches, the cast, and other elements. While I like the content, the interface stinks. The “nuggets” pop up with great frequency, so we constantly depart the main program to see them. Why not just make this a standard video commentary that doesn’t force the viewer to do so much work? The remarks offer interesting material but it’s a real chore to get through it. Next comes a DC Entertainment Tour. It fills seven minutes, 16 seconds and shows Green and Senreich as Johns shows them around the DC Entertainment offices. This seems sure to create fanboy envy, as it’s a blast to see the various nooks and crannies laden with goodies. Stoopid Alter Egos goes for three minutes, 46 seconds and shows various Chicken staff as they prepare for and attend a party. This is probably fun for those involved but not as interesting for the rest of us. After this we get a collection of Outtakes. The reel runs two minutes, one second and shows the actors as they record in the studio. It seems fairly tedious. We also find 13 Cut Sketches. These run a total of 15 minutes, 15 seconds and let us see a variety of ideas that didn’t make the show. These appear via storyreels, so don’t expect any final animation. They vary in quality but remain fun to see. Finally, we get something called 5.2 Questions. The two-minute, 13-second piece features Green, Senreich, and Johns as they answer 5.2 questions. They’re innocuous but enjoyable. An affectionate spoof of superheroes, Robot Chicken DC Comics Special doesn’t deliver consistent hilarity, but it’s generally amusing. Although it lacks great highs, it maintains a decent level of comedy and remains enjoyable across its brief running time. The Blu-ray offers good picture and average audio as well as some fairly positive supplements. Comic book fans will probably dig this parody.